On the auspicious occasion of 27th Rajab, Syedna Khuzaima Qutbuddin TUS led Maghrib Isha namaz, Washeq and prayed the Sadaqallah Doa. 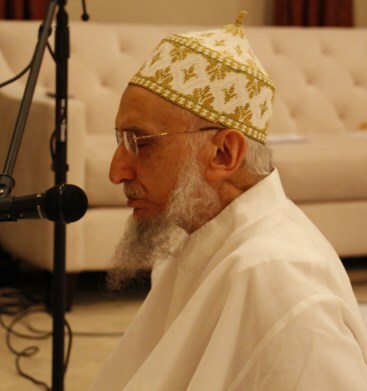 Taking the wasila mubaraka of Panjetan, Aimmat, and Dua’at Kiram – especially Syedna Taher Saifuddin RA and Syedna Mohammed Burhanuddin RA, Syedna Qutbuddin performed many powerful doas for mumineen. Syedna Qutbuddin said that Rajab is the month of Amiral Mumineen and this is the night that Rasulullah had the sharaf of Me’raj. Syedna Qutbuddin continued to say that there is no Prophet that has had a similar honor as Mohammed SA. He is the Sayyid-ul-Mursaleen, the leader of all the Prophets. This was the night that Rasulullah climbed the seven skies and spoke to God- he was no further than the edges of a bow. It was the night that Rasullulah traveled from Baitullah (Mecca) to Masjid-e-Aqsa (Jerusalem) where he then led the namaz for all the anbiya starting with Adam SA and every nabi after him. God has given the most knowledge and fayz to Rasullulah.